What if Alice was not the only one to wander into Wonderland? Not only that, but what did everyone else experience when Alice fell down the rabbit hole? 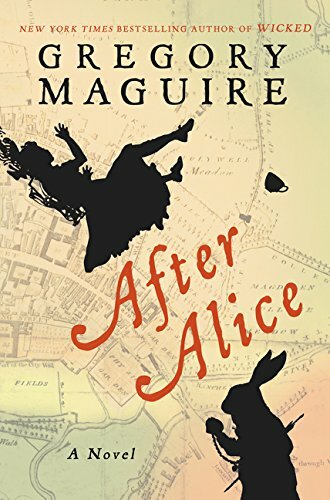 After Alice, by Gregory Maguire, explores the goings on of the people close to Alice while cleverly incorporating events and characters from Lewis Carroll’s classic tale (who ate the marmalade?). Gregory Maguire, of Wicked fame, tells the ‘other’ story. Usually told from the perspective of the peripheral characters in classic fairytales – the wicked witch, the ugly stepsister – Maguire puts a twist on the classic story. His style of writing – use of obscure words, garrulous descriptions, and almost archaic prose – can be challenging to follow at times. As a reader, you either enjoy his books or you don’t. However, if you’re able to settle into the story, Maguire’s style takes on an almost lyrical quality. In After Alice Gregory Maguire masterfully mimics the quick, witty, and often nonsensical dialogue of Carroll’s original story. After Alice follows Ada, Alice’s friend she briefly mentions in Carroll’s story, as she falls down the rabbit hole and searches for Alice in Wonderland; Alice’s sister Lydia, who is charged with watching over distractible, wayward Alice; and Ada’s harried governess as she and Lydia search for the missing girls. Maguire revisits Carroll’s cast of characters as Ada encounters them providing their perspective of their encounters with Alice. Once again, Maguire focuses on the peripheral characters of a classic story, providing insight, perspective, and depth to characters that are often shiny and superficial; not by retelling the classic, but by creating a companion story told from a different point of view.